Senior Campaigns and Public Affairs Officer, Sam Pearse, looks at the upcoming general election and what you can do to put bowel cancer on the agenda. In late April, the Prime Minister called a snap general election which will take place on Thursday 8 June 2017. That means that up and down the country, candidates will be pounding the streets and knocking on doors asking for your vote to be elected to Parliament. One of the most common questions you will be asked by someone running for Parliament is “what are the issues that matter most to you?” It’s a great moment to tell candidates that we need to take action on bowel cancer. As a disease that’s preventable and treatable (especially when caught early), there’s more that must be done to change bowel cancer’s status as the second biggest cancer killer in the UK. You can help can ensure that MPs making up the next parliament hear that message loud and clear. We know that nearly everyone diagnosed at the earliest stage of the disease will survive bowel cancer, but only 15% of people are actually diagnosed early. Part of the problem is that in some areas people are being kept waiting for crucial tests that can detect bowel cancer early, when it’s more treatable. This is because hospitals that carry out these tests are struggling to cope with the amount of people being referred for tests and don’t have the capacity to deal with increasing demand. We’re campaigning to improve this through our Right test, Right time campaign. Lynch syndrome is an inherited, genetic condition that increases the risk of cancer by up to 80%. There are around 175,000 people in the UK with Lynch syndrome, but hardly any of them know they have it because families aren’t being tested for the condition. Even for the small proportion of people that do know about their condition, no one is taking responsibility to ensure they are being regularly monitored to reduce their risk of cancer. That’s why we’re calling on UK health ministers to urgently step in and take responsibility for improving the diagnosis and care of people with the condition. 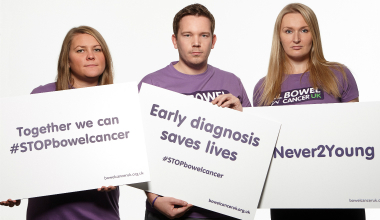 More and more young people are being diagnosed with bowel cancer. In fact each year over 2,500 people are diagnosed with bowel cancer under the age of 50 in the UK. Younger people are often diagnosed late when the chance of survival is lower because they’re seen as being “too young to get bowel cancer”. We need to get the message out there that you’re never too young to get bowel cancer. Although we often don’t associate politics with the way we treat diseases, MPs can play a valuable role in supporting our campaigns. Their high profile position can unlock debates, shine a light on local and national issues and can serve as allies in our efforts to improve services. That’s why we need MPs to commit to raising issues in Parliament. If you speak to any candidates about these issues we’d love to hear about it. Just drop us a quick email at campaigns@bowelcanceruk.org.uk with the name and party of the candidate and what they said. To stay updated on the general election and beyond and to help us lead the change for people affected by bowel cancer – sign up to become a campaigner. Together we can STOP bowel cancer.